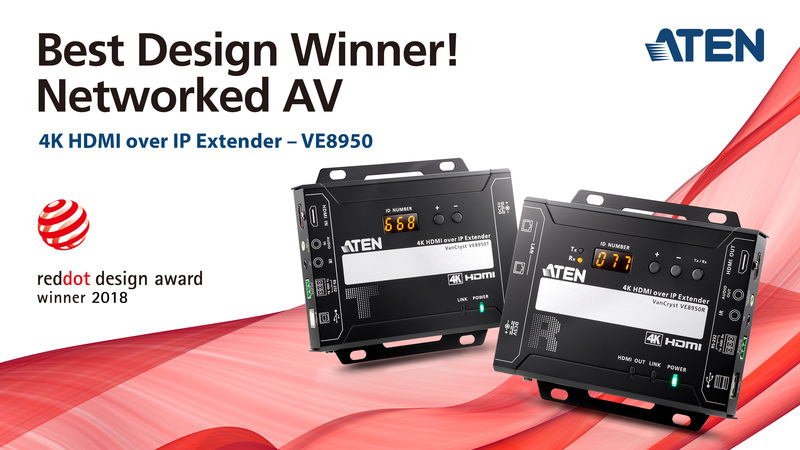 Taipei, Taiwan (Apr 9, 2018) – ATEN International, the world-leading provider of IT connectivity and total management solutions, announced today that its VE8950 4K Video over IP Extender has awarded the Red Dot Design Award 2018, one of the most prestigious design awards in the world. VE8950 received the honor for its human-centric design, which provides system integrators the best user experience to solve problems while creating solutions for large-scale digital signage and video wall deployments covering hundreds of meters, such as campuses, stations, malls, and exhibition centers. Established in 1955, the Red Dot Award is one of the biggest design awards in the world and is decided by the Design Zentrum Nordrhein Westfalen in Essen, Germany. The award features products that are recognized for functionality, innovativeness and quality. In 48 categories, manufacturers and designers can enter their innovations. The jury only awards a Red Dot to products with a high design quality. ATEN VE8950 delivers visually lossless 1080p / 4K video over long distances via a standard Gigabit network, offering the flexibility, scalability and multi-functionality required for large-scale digital signage and video wall deployments covering hundreds of meters, such as campuses, stations, malls, and exhibition centers. The VE8950 is designed to solve the problems that systems integrators face when implementing AV over IP systems by providing an economical and easy-to-use digital signage solution with user-focused hardware design. With large, clear ID displays and simple pushbuttons for ID setting and switching, the VE8950 offers simple configuration that does not require extensive IT experience. The units feature I/O printing on the housing for easy port recognition, built-in brackets for convenient mounting, and LED lights for quick diagnosis. There is even a dedicated space on the units for writing labels and a signature ribbed edge design to enhance the structure and provide ease of handling. A further user benefit is the ability to daisy-chain units for easy expansion of AV network coverage without cable clutter or extra network switches while also lowering per-port costs. For more product information, please visit the VE8950 product page.